Named for their habit of rolling into tight defensive balls, roly-polies are interesting and educational pets that can appeal to young nature lovers. Although often misidentified as insects, roly-polies are terrestrial crustaceans of the order Isopoda. 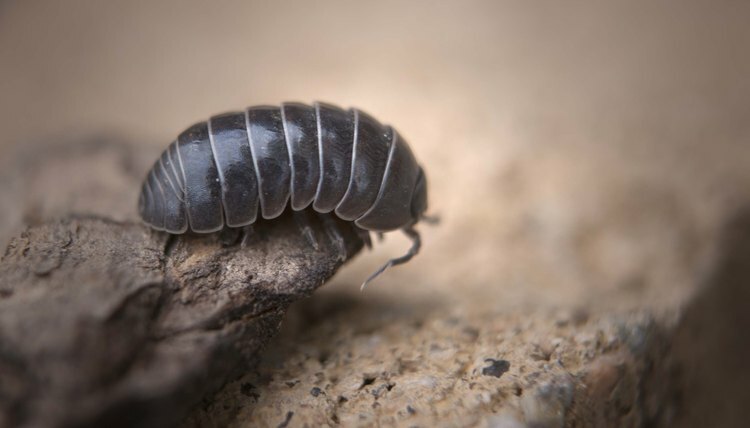 Also called pill bugs, sow bugs and wood lice, roly-polies are relatively easy critters to care for, as long as you give them a humid habitat and feed them well. Like many other isopods, common pill bugs (Armadillidium vulgare) -- the most widely kept pill bug species -- are social creatures that often cohabit with conspecifics. Accordingly, you can keep many species of roly-polies in the same cage. With luck, your colony will include males and females, which are likely to breed. In stark contrast to some of their 12-inch-long marine cousins, roly-polies reach less than 1 inch in length. Accordingly, they do not require much space; an aquarium, plastic cage or storage box with 5 to 10 gallons of capacity is adequate. Cover the bottom of the cage with hardwood mulch, organic topsoil or newspaper. Add plenty of items for the roly-polies to explore and to shelter under. Try pieces of bark, flat rocks, cardboard or crumpled paper. Keep their environment humid, as pill bugs breathe via gills rather than lungs. As their gills work only when moisture is present in the air, you must mist the enclosure and substrate several times per week to keep the cage suitably damp. Change the bedding periodically, and prevent mold from colonizing the cage. A secure lid will keep unauthorized hands, pets and flies from entering the tank. You can cover about half the ventilation holes in the lid to reduce the rate at which the cage dries out. Supplemental lighting is unnecessary, but provide your pets with a translucent container so indirect light shines through the cage during the day. Unlike some of their bizarre relatives, pill bugs eat a wide variety of plant-based foods; they may even eat cardboard or paper placed in the cage. Decaying organic debris is roly-polies' primary food in the wild, but table scraps such as carrot tops, apple peels and celery stalks are suitable foods, as are sweet potatoes, squash, collard greens, zucchini and grapes. You can supply your roly-polies leaves from outdoor plants and trees. For best results, provide roly-polies about 1 or 2 ounces of food twice or thrice weekly. Each meal should include different food items. Rotate through different foods over time, to help prevent nutritional deficiencies. You d't have to cut your roly-polies' food, as they will nibble on the pieces they intend to eat. Pill bugs derive their moisture from their food, so a water dish is unnecessary. Use care when handling your roly-polies. Despite their protective exoskeletons, they may die if you drop them or grasp them too tightly. Allow your pet bug to crawl around your outstretched hand, and keep your hands over a table or some other item to prevent them from falling to the floor should they scoot off your hand. Avoid using insecticides in the space your roly-polies occupy. Do not allow direct sunlight to strike their enclosure, as it may raise the internal temperature and overheat your roly-polies. With good care, roly-polies can live for up to 3 years.